Cambridge Audio Aero 6 review | What Hi-Fi? The Cambridge Audio Aero 6s are no stranger to us. The standout product in our two-time award-winning Cambridge Audio Aero 5.1 home cinema package, they have been regular visitors to our hi-fi rooms over the years, but always in the company of their Aero cohorts. Now taking the floor as solo entities, and after a considerable price drop from their original £650 tag, the Aero 6s are something of a steal. You get a great deal of tech for your money here. Of course, we’re referring to the BMR (balanced mode radiators) driver, which appears frequently in the company’s higher-ranging models. The driver covers a wide frequency range (250Hz to 2kHz) allowing the crossover point to be moved to a region where our ears are less sensitive. The distortion inherent in any frequency handover is less audible, resulting in a cleaner sound and better integration. At a glance, you could mistake the BMR for a tweeter; the small (4.6cm) driver sits above the twin 16.5cm mid/bass drivers, which tackle the rest of the frequency range. Aesthetically, the conventional straight-edged cabinet is pleasing, cloaked in a smart wood veneer of either black or walnut. The baffle is neatly symmetrical thanks to a small front-firing port below the mid/bass drivers mirroring the size of the BMR driver. The front port means they are a little more flexible about being positioned near a wall, though pulling them out a little (and toeing them in) is our preferred set-up. At 98cm tall and suitably chunky in proportion, they are relatively imposing, but find them a home and you’ll be in for a treat. Offering an invigorating listen full of insight, focus and enthusiasm, the Cambridges are undoubtedly competent performers. In fact, compared with their price-matching competition, they’re quite special. They scoot through Blue Swede’s Hooked on a Feeling with punch and enthusiasm, delivering strong rhythmic drive and capturing the upbeat melody’s fun factor exactly. The track’s catchy ‘hooga chaka’ chant reveals an expansive and open soundstage with an impressive sense of scale. That’s what makes the Aero 5.1 package a star with movies, after all. The Aero 6s are direct and forward, with an assured rather than assertive manner. There’s control to keep things steady and clean, and couple that with fine balance and decent precision and you have speakers that are hard to tear yourself away from. 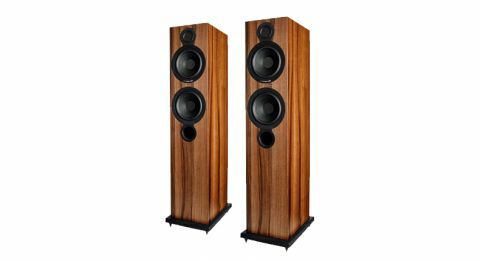 At £500, the Q Acoustic 3050s may be sprinkled with more subtlety, but the Aero 6s’ hearty presentation is alive with fine detail, and they aren’t afraid to parade their dynamic prowess either. Play Aggressive Expansion (from The Dark Knight soundtrack) and the drums gain intensity as the momentum builds, each strike potent and forceful. Bass isn’t the most agile we’ve heard, but it never feels lacking in punch or power. The BMR driver fulfils its promise: treble is far-reaching, detailed and composed. Either side, vocals – be it Eva Cassidy’s angelic tones or Kanye West’s sharp tongue – are distinct and lifelike. The Aero 6s have been knocking around for a few years but they won’t be around forever. If these fall into the top bracket of your budget, we’d urge you to get your hands on them while you still can. You won’t get better floorstanders for £400.